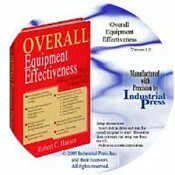 Written primarily for those responsible for the reliability of equipment and the production operation, this innovative book centers on developing and measuring true Overall Equipment Effectiveness (OEE). The author demonstrates that true OEE correlates with factory output, provides a methodology to link OEE with net profits that can be used by reliability managers to build solid business cases for improvement projects, and draws on his own experience by presenting successful improvement applications in every chapter. Additionally, it will also help practitioners better understand Total Productive Maintenance (TPM) and develop an effective foundation to support Reliability-Centered Maintenance (RCM). This is the CD-ROM only version of this popular title. • Develops a minimum set of definitions, a practice application, including three methods of computation, and reconciliation of OEE and various losses. • Provides the platform and reasons for maintenance and production to work synergistically. • Helps to identify the “hidden factory” that exists within the current system in order to begin leveraging its' potential into real bottom line results. • Integrates the famous “Theory of Constraints” aspects into an easy to understand shutdown strategy example. • Contains many practical examples throughout to illustrate techniques and methods in a way everyone can easily understand.